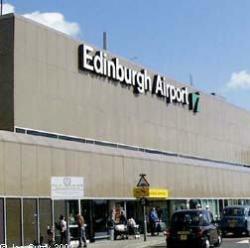 Edinburgh Airport is situated eight miles from the City Centre and is where 40 Airlines operate to 100 destinations, the Airport started commercially in 1947 and passenger numbers have risen since then to 9 million in 2007, there are good transport links with busses, coaches and taxis, for passengers wishing to drive, the route is clearly signposted from either direction, if travelling from Edinburgh journey along the A8 towards Glasgow, if travelling from a different direction travel along the A8 toward Edinburgh. Once at the Airport there is a choice of short and long stay spaces in the car parks, or for passengers wishing to ease the stress of travelling there is always Valet Parking…… The Terminal Building is spread out on two floors with Arrivals on the ground Floor and all Departure Gates are situated on the First Floor. The Check In Desks are in the Main Terminal, or for speed there is always the choice of passengers who wish to Check In themselves and print off their own Boarding Cards. With a choice of shops, restaurants, cafes and bars, many of which have a children’s menu, and high chairs on offer. For a great deal on perfumes, and spirits there is always the Tax and Duty Free Shopping to take advantage of. For the all important nappy change there are baby changing areas throughout the Terminal. Disabled travellers are well catered for, with designated parking, use of wheelchairs, adapted toilets, Induction Loop for the hard of hearing, and Help Points around the building where passengers can request help with their luggage or directions etc.. The Information Desk has complimentary colouring books and crayon packs with the chance to photocopy or fax information. The Executive Lounge offers space, comfort and complimentary drinks with WIFI access, telephones and fax facilities.